News | Aurora Multimedia presents the first ever 8 port 4K60 4:4:4 HDMI Splitter | Aurora Multimedia Corp. | Lowrance Sound Company, Inc.
Aurora Multimedia presents the first ever 8 port 4K60 4:4:4 HDMI Splitter with downscaling per individual output. The DXE-218 delivers enhanced capabilities such as individual CEC control, EDID management, Hot Plug Detection, and EDID reporting per output. This is all done through the LAN port for full control and statistics of all ports. In addition, the downscaling per port allows 1080p screens to be utilized on the same splitter with a 4K60 source. To round out the solution, the DXE-218 has 2 input ports to select from to change content remotely. The PoE simplifies cabling by eliminating all external power supplies. 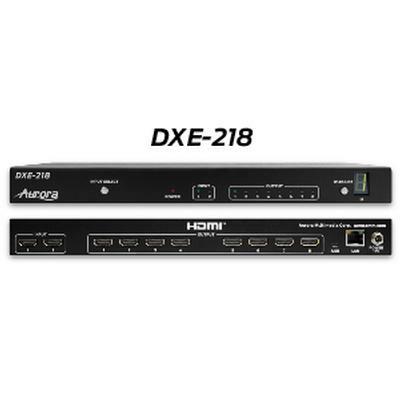 Depending on the network switch, the DXE-218 can even be power controlled remotely.